Paul Wirkus is a German musician based in Cologne who works with electronics and percussion. We heard him performing on Adikia with Ekkehard Ehlers, with whom he regularly works, but I’m surprised we haven’t noted any of his solo works before, as he is exceptionally good. The record Discours Amoureux (EDITION BEIDES 2) is something I can wholeheartedly recommend to anyone who wants to hear genuinely expressive and considered experimentation in the field of digital / electronic music, an area which is over-populated with too many half-baked ideas. The clarity of Paul Wirkus’s ideas, and the conviction with which they are executed, shine forth exceptionally well on this release. Although you could easily pigeon-hole this sound into “laptop” or “ambient” music, the record transcends these labels. 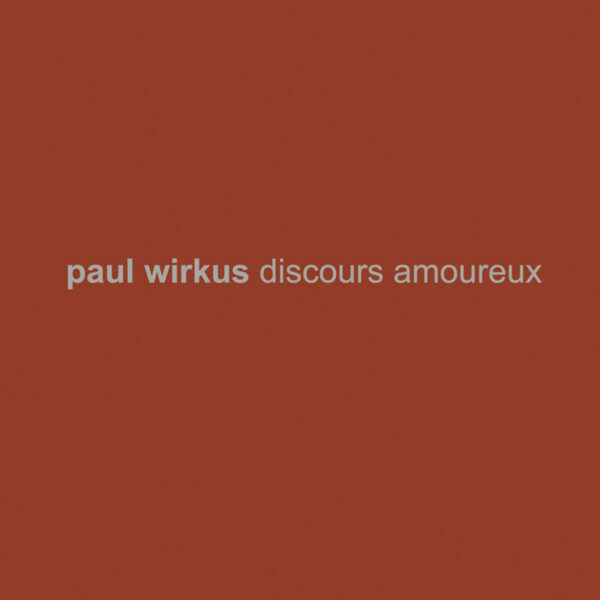 Wirkus himself describes Discours Amoureux as a “psycho-acoustic essay”…he intends the music to represent imaginary walks he takes in his mind, and combines the sounds of these walks with actual field recordings captured in the city [of Cologne], while on a search for inner piece or mental calm. It seems significant that he did it in the summer; perhaps the sunlight itself contributed to the sense of well-being that permeates this music. From a technical point of view, he executed the work mostly through live playback from one computer onto another computer dedicated to recording; I get the sense that he’s not one of those obsessed with infinite tinkering of sound files, layers, and edits, a pass-time which it is possible to be drawn into when you embark on the path of laptop composition. There’s a certain warmth and spontaneity which has transferred directly into the digits; but I am assuming that this is the result of much preparation, thinking, and compositional rigour. Other journalists and music organs have long recognised the genius of Wirkus, and he’s not ashamed of the many prizes and “CD of the month” awards that have come his way. His catalogue can be found on labels such as Staubgold, Gusstaff Records and Quecksilber, and the earliest one I can find suggests his recording career began in 1999. This is the second release on Edition Beides, and follows his Carmen Et Error also released in 2016. Recently Wirkus has been expanding his act into multi-media projects, including radio plays, music for dance, and theatre. A lot of musicians try this sort of thing, but one listen to Discours Amoureux should persuade you that Wirkus has a strong grasp of narrative and structure, and is skilled enough to express this very clearly in his work. Very good. From 14 November 2016. Previous Post:Who Let the Dogs Out?